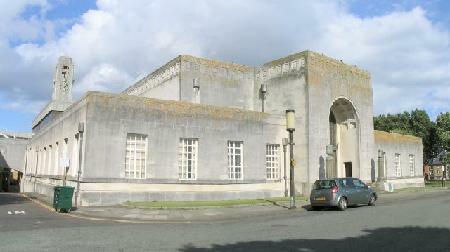 You Are Here: Mumbles Memories > Vote, vote, vote! Vote! Vote! Vote! For Harry Libby! In the not too distant future, multi-coloured pamphlets will be cascading through everybody’s letter box with all the heavy delivery fruttle of a Christmas load. This is one of a series of assaults upon the mind of the voter. Each pamphlet will carry a name, political party alignment, some written matter and, a rather frightening photograph. This photograph, of the candidate, can win or lose a thousand votes and therefore, much time and expense is lavished upon it, in an attempt to get that critical image of honesty, patrician sincerity and-I-am-only-doing-this-for-you-not-me look. Alongside this disturbing portrait is a text which supplies such information as to committee memberships, academic qualifications (eg eleven plus, joined-up-writing, BA (Expenses) Oxon, et al) and, the love of the simple family life, never missing “Coronation Street”. A list of society ills is included with a heartfelt pledge to heal them all, but never, how, (only the boys propping up the bar in the White Rose have all those answers). Yes! Election time is upon us! Suddenly, we, the rank and file, have become important, and, will remain so, until the last vote is cast. Then, whoever wins can vanish into the shaded, oaken cloisters of Westminster’s subsidised oblivion. As a boy in the thirties, I was barely aware of the machinations of national politics, even though those were very turbulent times. I suppose that the odd General Election came and went but left no lasting impression. To me, and my grubby cronies, it was the Local Elections that had the appeal and it was these that did leave a lasting impression. Very much so! 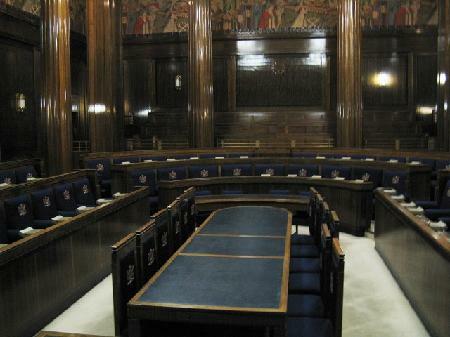 Swansea Council Chamber in the Guildhall. The battle for places on the Swansea Town Council, in those days, was a far more colourful and demonstrative affair than the rather apathetic, decorous process experienced today, spilling over onto streets of the community in dramatic and clamorous fashion. The children of Mumbles played no little part in adding to that excitement and hullabaloo. How much more stirring it was! Understandably, my knowledge of politics at the age of nine was rather nebulous, after all, there were far more important things in life to be concerned with, such as what was being screened in the Tivoli and the Regent, or, the current activities of heroes and villains in such gems of literature, as the Wizard or the Hotspur. Even so, I can still recall the names of worthy Mumbles citizens who battled for places on the Town Council, all of them being Mumbles gentlemen, born and bred and living in our midst. They knew what made Mumbles tick! Weeks before polling day, posters bearing the names of such gentlemen as Edward Harris, Harry Libby, Abberfield, Jollife and Benjamin Hoppe festooned the village and I remember being very impressed by the brilliance of the latter’s poster: the top half carried the surname- “HOPPE”. But the brilliance lie in the lower half! Here, was the scintillating flash! Such a clever play on names! Indeed the fruits of a mind of genius! I had never been confronted by such intellectual achievement as this, before, in all of my nine years. I rushed home and caught my father at tea. I described the contents of the poster to him, explaining carefully the brilliant play on names. He seemed singularly unimpressed and muttered something about there being enough comedians on the Council already. Election Days were welcomed by the children for a number of reasons, not the least being that the schools were commandeered for use as polling stations, hence the granting of a day’s holiday. Mumbles had its tradition of the Election Marching Bands. Children aged from about eight to fourteen would get together and create a band to support one, or other, of the Mumbles candidates. There were usually two or three of them. Perhaps the source of the biggest, and certainly the noisiest, lie in Woodville Road. I remember clearly one such band in the thirties, fifty to sixty strong, under the direction of the ebullient John (“Butty”) Hinds. Butty recruited them, drilled them and supervised their equipping. They always marched in support of Harry Libby who, one day, was to become a most worthy Mayor of Swansea. The equipment? Biscuit tins of all shapes and sizes, were begged, borrowed or stolen. Lids were discarded, they were inverted, holes punctured in the sides, string threaded through and the tins then suspended from the necks of the young would-be-drummers. This was the kettle drum section. Their ensemble was completed by two pieces of stout kindling wood, roughly hewn into the shape of drumsticks. Two or three small oil drums were similarly converted and slung around the necks of the more sturdy members- this was the bass drum section. Twenty lads, or so, stole their sisters’ combs and, with tissue paper (or Izal toilet paper) made kazoos or, if privileged, bought a threepenny one from Woolworth’s. This was the wind instrument section. One lad had acquired a bulb horn from Mr. Apsey Peachey’s Garage which he used with great skill to establish a background rhythm. “Vote! Vote! Vote! for Harry Libby! Here comes Harris at the door! We’d punch him in the jaw! Two weeks or so before Polling Day, the bands would hit the streets after having drilled and rehearsed themselves to a fine election pitch. This was an entirely voluntary and self-created scheme, performed with tremendous enthusiasm, excitement and dedication. The same song was sung by all the other bands but, of course, with different names substituted. They made quite an impact! Certainly in terms of the noise generated! They marched every evening after school, all day on Saturdays but, of course, with respect for the Sabbath, rested on Sundays, (life was like that, once). On Polling Day itself, they hit the streets early after breakfast and apart from a short break for dinner (lunch in Langland), marched until the last polling station had closed its doors. I remember, with remarkable clarity, one lovely Spring evening, with Gloucester Place basking in the sunshine, the faint, distant sound of approaching marchers. The usual quota of children were playing, up and down the length of the street, when, borne from Overland Road came the sound of the rhythmic beating of drums and the crunch of marching boots. Suddenly Butty Hinds appeared at the top of Gloucester Place, proudly leading his band which he had drilled to perfection. Round the corner they came, sixty Mumbles lads, stout and true, following their leader who sported a length of varnished curtain rail impaled upon the end of which was a large brass doorknob, glittering in the evening sun. This he carried majestically before him, waving and signalling turns, halts and orders to his loyal troops. No “Trooping the Colour” Bandmaster could have borne his mace with greater pride. Down Gloucester Place they came. Crunch! Crunch! went the studded boots. Boom! Boom! went the bass drums! Tiraddle! Tiraddle! went the kettle drums! “Vote! Vote! Vote! For Harry Libby!.. In the narrow street, the sound of crunching boots, buzzing kazoos, booming and tattooing drums and young shrill voices, blended into a stirring symphony that came crashing back from the walls and eaves. Only the dead could not be stirred by such sound and spectacle! Children stopped playing and moved back to the gateways. Watching mothers and fathers stood on doorsteps to wave these fine young lads on their way and how they responded to this reaction! With pride, manifest in the flush on their faces and their pulled back shoulders, they marched with a guardsman’s swagger. although fighting fatigue. For just a few moments in their young lives, they felt just that little bit special! It was impressive and, without doubt, brought colour and verve to what was really a rather humdrum adult affair. They gave their all until the electoral officers shut the doors at the end of a long day. Leg-aching, hungry lads then homeward plodded their weary ways, tired but inwardly glowing, perhaps, unaware that the source of their joy was from that intangible something they had unwittingly shared, called camaraderie. Was there any material reward? Certainly, a successful Harry Libby was magnanimous in victory and hosted a tea party in the Victoria Hall with all the trimmings; crackers, balloons, paper caps and small gifts. This brought a rare bit of colour into the lives of these village lads who had no expectancy of tangible reward. The true joy had already been experienced in their shared deed. Seven or so decades on, and I now see an uncanny parallel with the prognostications made in an Alexander Korda epic film, of 1936, “ Things to Come”. This was based upon H.G. Wells book: “The Shape of Things to Come”. With remarkable foresight, Wells predicted a middle of the 20th Century World War with the destruction of civilisation, as we then knew it. Early in the film, as international tension was building up, a little boy is seen, wearing a tin hat and with a toy drum slung around his neck by a length of string. He marches up and down his garden beating his drum- playing the soldier bravely off to war. Skilfully, the camera moved, rising slowly, and away as the boy’s shadow lengthened behind him. Both boy and shadow then slowly disappeared into a swirling dense mist. A short dramatic pause was followed by the sounds of ominous rumblings and then, massive shapes began to break through this awful obscurity- defining themselves as tanks, with flashing gunfire erupting from their turrets. In close support, heavily equipped infantrymen followed, stumbling and falling. The dates of the years rose over the scene, one after another and, simultaneously, so did the design of the tanks become more exotic, symbolic of the progress of weapon design as nation outbid nation in attempts to destroy one another. The little boy, of course, was the innocence of humanity and represented the cannon fodder which his generation was to become. Looking back now, I realise that the Woodville Road boys were marching to beating drums at the same time as the lad in that film of 1936. Here indeed was that parallel and within a few years, just about every member of that band was serving in His Majesty’s Armed Forces. Butty Hinds was to serve with honour as a Radio Officer in the Merchant Navy, Percy Thomas and Warnock Hunt were to perish at sea as teenagers. Others were taken from their homes to serve in all parts of the world, some not to return. As in other parts of the United Kingdom, with the outbreak of World War 2, many traditions went into hibernation, some never to wake up again, as was the sad fate of the Election Marching Bands of Mumbles. Of one thing, I am certain! Those bands were far more likely to rouse the reluctant voter from his apathy than all the bits of coloured paper that arrive on the doormat today! But! did they have any influence on political opinion? I think not! Once a villager’s mind is made up in Mumbles, it is as if chiselled on tablets of stone and I suspect little has changed that, to this very day! That is not true and the only chance of putting things right is to vote the right people in, to clean the stable out. What a shame the Mumbles Marching Bands are still not with us any more, to drive us out of our homes! Those crunching boots, the beating drums, the gazoos and those young, young voices!